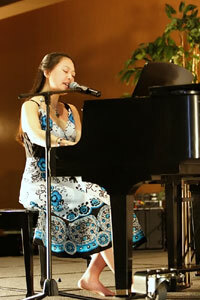 Where Jazz, Taiwan, and the Vocal Stylings of Jen Shyu Fuse. Posted on Saturday, April 19th, 2008 at 4:37 am. “It doesn’t matter if you don’t know the music well, I just want you to sing it loud and proud,” Jen Shyu declares, as she teaches a traditional Taiwanese folk song to a group of her peers at the North American Taiwanese Womens Association’s 2nd Generation program in Los Angeles. This is, after all, a conference where the focus is on connecting the community, bridging this generation with the ones before, and taking pride in their collective sisterhood. During this session, Jen easily captures the group’s attention both with her glowing, forceful stage presence as well as her beautiful and captivating voice. Officially, I am here on behalf of TaiwaneseAmerican.org to support NATWA II and to raise funds for their excellent array of year-round programs and scholarships. But secretly, I feel privileged to be surrounded by a group of talented and amazing women representing various professions, from community organizers to industry executives, from physicians to filmmakers. Artists certainly abound in this unique group of 2nd generation Taiwanese American women. Vocalist and composer Jen Shyu is certainly no exception, as her name is familiar among the modern jazz circles around the world. 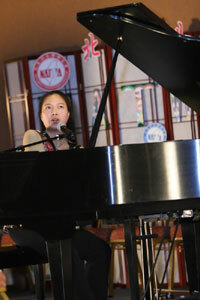 She is here at this conference to perform at the closing night dinner and to share her stories with at least three generations of women of Taiwanese heritage. I’m fortunate enough to chat with her briefly to find out more about her dynamic career. H: How do you describe your music? Does “jazz fusion” correctly capture the essence of your style? J: Well, I would say my music is a combination of who I am starting with the classical training I received, similar to many Asian Americans who are the children of immigrant parents. In this generation, there are many like me who pursued piano and violin, but in high school and college, I also studied opera. Then, I went through a rebellion period after college graduation. J: Yes, I had met a group of Asian American jazz musicians, and that was my entrance into jazz and “creative music.” They inspired me to draw from my ancestry as an influence on my music. the real meaning and spirit of jazz. What it means to me now is a gestalt and complete unity of influences, from the music of Taiwan that I began to research, from classical to straight-ahead jazz, and from traditions around the world such as in Brazil and Cuba. From this process of self-discovery comes my music. H: I must admit that I am quite impressed by your music and all the great musicians you’ve worked with, including Francis Wong and Jon Jang who are certainly well-recognized as musicians and activists! J: Yes. I think what they taught me as well as other creative artists in the Asian improv circles in the San Francisco Bay Area was to widen our range. The artists in the Asian Improv community weren’t just Asian – they were any creative artist searching for their roots, whether they were Native American, Egyptian, Puerto Rican – we were all in touch with this part of expressing ourselves. As Francis advised, “you should find out what your job is in this world, this universe.” Both Jon and Francis were mentors that offered such sacred wisdom. Even as I moved from San Francisco to New York, their influence was and still is strong. They were my “creative parents” since my real parents weren’t musicians or artists and couldn’t give that specific advice to me. Jon and Francis were so politically active, and they inspired me to be as well. H: Talking about people, places, and time… you’re so well-traveled! You’ve been to Holland, France, Italy, England, and Germany. You tour regularly through other parts of Europe. And currently, you’re in New York singing with Steve Coleman and Five Elements, right? J: Exactly. That was another big change for me. I had lived in San Francisco for three years prior to meeting Steve Coleman. I was introduced to Steve by a Cuban drummer friend when I was visiting New York. At that time, I was just considering moving to New York, but I was still a little scared. When I met Steve and gave him my jazz CD, he said to me later, “well you have a nice voice, but what do you want to do with it? Do you want to just sing jazz standards or do you want to put yourself into the music?” What he was saying to me was that I should work harder to create and compose music that included my background. He thought that I had more potential than singing other people’s jazz songs. He pushed me to go further. He also pushed me to go back to Taiwan – the last time I had been there was when I was 7 yrs old. H: Tell me more about that, the desire to find Taiwanese influences. J: Working with Asian Improv gave me the initial desire to investigate Taiwanese folk songs. Before I went off to college, my dad had stuffed a collection of folk songs into my luggage. But because I was into musical theater, opera, Western classical music, and other music,I never looked at it. Francis and Jon inspired me to check out that Taiwanese music and see if I could do something with it, which they often did in their music. So that was when I realized I need to go back to Taiwan in order to see the land, be among the people, and speak the language to really understand where this music was coming from. But I was floating, riding on the standards CD I had just produced, waiting for a grant which I didn’t get… and I knew that I eventually wanted to move to New York and also go to Taiwan, but I had this apartment lease, this teaching gig, a car, all these other excuses. So during this in-limbo period, I took some lessons with Steve, who was conceiving an album with voices and he was interested in my voice. When I told him of my desire of going to Taiwan as I knew it was the only way for me to get inside of those folk songs, he simply said, “Why don’t you just go? You could get hit by a bus tomorrow, and then what? You have to go now!” I took him seriously. During those lessons, he introduced me to the music of Charlie Parker, Art Tatum, Von Freeman, in that he had me listen to their improvisations by ear and sing it back by memory. It was difficult at first, like learning a new language. This is where it really begins – listening and getting inside of the music, the era, and the mentality – this is how you begin studying improvisation. And one of the most sophisticated traditions of improvisation is this jazz tradition which was developed by African Americans, which inspired me to find myself. After those lessons, I broke my apartment lease, quit my teaching gig, and went straight to Taiwan. H: That is amazing! Share some of your experiences in Taiwan. J: I went for two months on a low budget. I visited my father’s relatives who gave me some leads to finding some folk music singers like Tsai Chen Nan and aboriginal scholars and singers, like this urban Amis tribe choir managed by a government councilman and activist named Song Jing Tsai. These were great leads since I basically started from zero, just hanging out, learning Mandarin by immersion. I took some conversation lessons and tried to get a feel for things culturally. It was amazing. I came back, sang on a recording with Steve. And after that, I went off to Cuba to research the Chinese community and the history of Chinese laborers in Cuba, which was another desire lying dormant. I planned this trip when I planned the Taiwan trip, following Steve’s advice – his advice was basically the catalyst for me to do all the things I wanted to do. He always said that “Success is doing what you want to do. It doesn’t have to be fame or money like how most people see it.” I remember him also telling me that “money is an illusion” in that you don’t need a lot of money to do what you want to do. I really found that to be true on my trip to Taiwan, and those words have since been liberating. After that, he asked me to sing on some gigs in Europe, so then I moved to New York and have been in his band ever since. 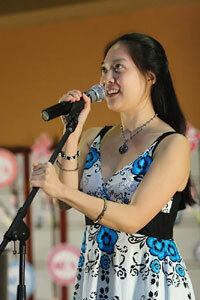 H: What’s it like being a Taiwanese American woman in the world of jazz? I know I certainly can’t name any other person doing what you are doing right now. J: Well I think it is powerful thing for me. My father is Taiwanese, my mother is from East Timor. I’ve related in the sense that I believe in freedom and human rights. Liberty – it seems Taiwan has been robbed of that time after time with a history of being colonized. It’s something that speaks to me very strongly. So I try to create my own sound, my own path. I don’t want to just go straight classical, straight jazz or pop. Or just to make money. It’s an underground venture, not just about money or popularity. It’s the whole Taiwanese fight as the underdog. I feel a certain resonance with that. Even what I’m doing is a political statement in itself. I’m not following what most parents are expecting, pursuing that safe job, doing something more mainstream. In going against that, it is a political statement. It is a natural part of who I am. A lot of it stems from racism, growing up in the Midwest, and my desire for justice and to break stereotypes. Going through all of this, I realize that I am proud, and that I really want to share this pride with and influence other Taiwanese Americans. H: It’s your first time at this NATWA conference. Are you enjoying yourself? J: I love it. It is amazing to meet such amazing women with whom I instantly feel such symbiosis. It’s such a revelation that we’ve been through the same thing. It’s so great! It’s also great that the older generation is here at same time. It’s very inspiring. It’s a great reminder to me as well. As an artist, even though I love people, it’s easy to become engulfed by your art, and since I compose best in solitude without distractions, the act of creating can be a lonely activity. So it’s good to be in touch with fellow Taiwanese Americans. H: You’ve got your CD entitled For Now out. What’s next for you? J: I have another album that I want to put out; it’s my own original music, not jazz standards. It was cultivated over the past three years with my band called Jade Tongue in New York. The album includes some of these Taiwanese arrangements that I’m performing here at NATWA, and it’s my desire to share Taiwanese culture to mainstream America through these songs because the music and culture are embedded in each other. You can’t separate them. With my dad and cousin’s help, I translated the songs into English or Spanish, and I perform them in a modern and improvisational context. It’s still an ongoing project, and I hope to involve other languages to expose even more people to Taiwanese culture and music. I also have a community project I want to start. I want to gather children of immigrants who just moved to the Bronx, which is where I live in New York. I plan to hold workshops where these children of immigrants will have to learn folk songs from their parents first and then teach and learn songs from each other. Imagine that – Generations communicating culture through music, teaching each other, finding commonalities through music, learning from differences, promoting peace and understanding. It’s such a beautiful thing. H: One last question: Stinky tofu or bubble tea? J: Oh, one more thing I wanted to share; it is advice that I live by, or at least try my best. In the words of filmmaker John Cassavetes to Martin Scorcese: “Film what you want to film, what you need to film, not what you CAN film.” As with music, if you have the skills, it’s very easy just to execute the styles that have been well established, but it’s much harder work to do or create something that is really you. As I sit here and listen to her share her journey through the fusion of life and music, it’s clear to me that life and music are one and the same for her. She knows that challenges lie ahead of her in this very unique and stylized path through the world of jazz. I can see in her eyes that she realizes it is not going to be immediately rewarding materially or by mainstream standards, but I can already tell that she has succeeded in discovering what is most important – living life with passion. Ho Chie Tsai is the creator and manager of this web portal site, something that represents and serves the community he cares about. The organizers of NATWA II say he is an honorary member of their organization. As a guy, he definitely feels honored to be part of the sisterhood. It inspires him to continue doing the work he does. Girl power! Go!